You know I have a thing for owls. I think I've made that abundantly clear! But lately I've been loving another animal. Our friend the elephant. Every morning as I prepare for the crazy day ahead, I drink my coffee out of this cool elephant mug. Isn't she cute? In the Hindu religion, the deity Ganesha has an elephant head and multiple arms. He is revered as the Remover of Obstacles. 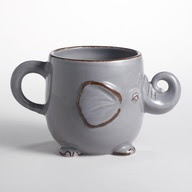 And so my little elephant mug reminds me of the obstacles I face but inspires me to work past them. In decorating, I like to place elephants by the door. It's my own little Feng Shui tip - a sign that you are moving obstacles out of the door. Life presents many amazing, unbelievable, incredible and unforgettable opportunities. And sometimes you have to bust through some major road blocks to get to them. But I'm going to keep plugging away - I can't wait to see what happens next! What an incredibly positive and inspiring post for me to read this morning. I've been in a state of flux for most of this year and I can't think of a better way to outwardly express my state of mind than to put a few elephants into my life! I love the mug and I'll look for it on my next trip to World Market! Homegirl in my Hometown Paper! !